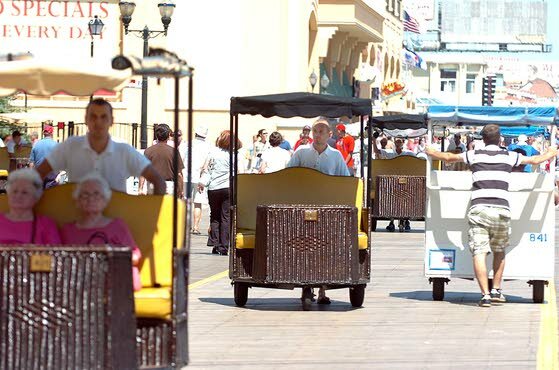 Zoran Knezevic, 25, of Bosnia-Herzegovina, center, works his rolling chair on the Atlantic City Boardwalk. Changes to J-1 visa applications apply to Bulgaria, Russia, Romania, Ukraine, Belarus and Moldova, which combined account for about half of the foreign workers in New Jersey through the CIEE, a nonprofit that places more than 10,000 foreign students with U.S. employers. Kristina Homan, of Belarus, checks her room cleaning schedule last summer at the Biscayne Motel in Wildwood. Many New Jersey shore businesses rely on foreign workers to run their shops, sell their pretzels, operate their rides and stock their shelves each summer. But this year, U.S. State Department changes to the J-1 student visa program mean employers may have a smaller pool of applicants. Phil Simon is the vice president of employer relations for CIEE, a nonprofit based in Portland, Maine, that places more than 10,000 foreign students with employers across the country, including in southern New Jersey. Most foreign students migrate to areas with large seasonal work forces. The change means students from six Eastern European countries need to land a job before they apply for the visas, reducing the opportunities for employers to hire workers who walk up to their doors, Simon said. The changes affect Bulgaria, Russia, Romania, Ukraine, Belarus and Moldova, which combined account for about half of the foreign workers in New Jersey through the program, he said. Simon said his organization supports the tightened regulations, which were put in place by the State Department following some reports of abuses throughout the country. The impact will be noticeable, he said. “Unless the word gets out to employers there’s a different timeline, if enough employers in a particular region don’t take action, there simply won’t be enough of the students in an area to make the economy run,” he said. The CIEE is telling businesses they should have their employees lined up by the end of March. Locally, organizations are warning businesses of the changes. The Atlantic City Hotel and Lodging Association has notified its members. The J-1 program has been a popular one in Atlantic City, Executive Director Howard Bacharach said. “I think all the properties use the J-1 students that are in town because they seem to be excellent workers, and because they’re here for just the summer, they often take more than one job,” he said. There was a similar outreach in Cape May County to notify potential employers. “I do feel this could have a significant impact for our businesses that depend on this international student employee pool to open their businesses earlier in the season before local people are able to go to work or keep those businesses open beyond the traditional end of summer, Labor Day weekend,” said Vicki Clark, executive director of the Cape May County Chamber of Commerce. Morey’s Piers in the Wildwoods is one of the region’s biggest employers of foreign students. The company hires 600 to 700 students from 30 countries, said Denise Beckson, director of operations and human resources. For Morey’s, the change will have little if any impact. The company itself recruits overseas, meaning students are hired well in advance. The company’s first recruiting trip of the season was in October, to Thailand and Singapore. “We pre-hire everybody, and generally don’t take walk-up students,” Beckson said. But Beckson sees how the changes can affect area businesses.